On a cold January 11 night, A Call to Action on Puerto Rico held a final rally in front of 26 Federal Plaza in New York City. Dozens of marchers brought leaflets, a large banner, and their loyal hearts. They rallied for the freedom of Oscar López Rivera, and they had millions of people behind them. Countless rallies, marches and press conferences were held. Millions of e-mails, phone calls and letters were sent. A petition with over 100,000 signatures was delivered to the White House. 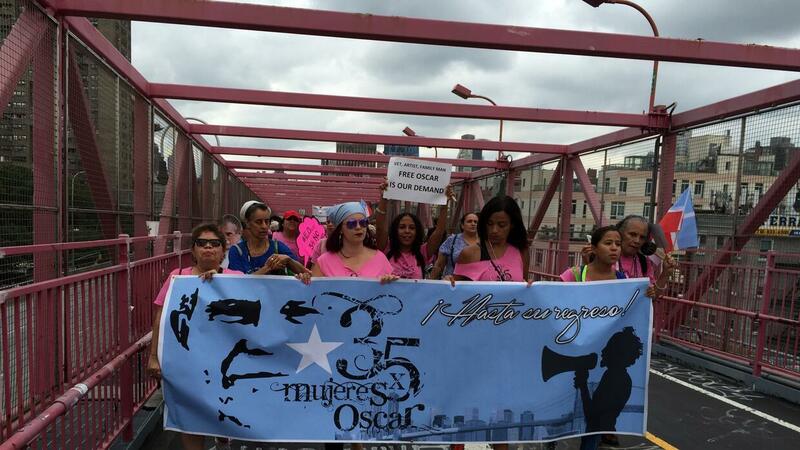 In New York, 35 Mujeres NYC x Oscar, A Call to Action on Puerto Rico, ProLibertad and El Maestro championed Oscar to the very end. Oscar was imprisoned for 35 years…jailed for seditious conspiracy: the same “crime” as former South African President and anti-apartheid leader Nelson Mandela. Somehow the US supports freedom, independence and social justice for South Africa, more readily than it does for Puerto Rico. But this did not deter the members of A Call to Action on Puerto Rico, or the courageous 35 Mujeres NYC x Oscar. Lourdes Garcia…Jesus Mangual…Prof. Ana M. López…David Galarza…Mariposa Fernandez…Benjamin Ramos…Frank Velgara…Walter Alomar…Fernando “Ponce” Laspina…They stayed and struggled for Oscar, until the very end. This type of character, conviction and sacrifice are necessary, for any real change in this world. And change they did…because in May 2017, Oscar will be set free. Saludos y un fuerte abrazo para todos los que dijeron presente en esta lucha contra la injusticia. La lucha continúa. No olvidemos de Leonardo Peltier y los demás presos políticos también. Como fue Mandela, Oscar también puede llegar a ser un símbolo internacional de esperanza para ellos. Dr. Rex:! “Jailed for seditious conspirousy,”! Thank you! Thank you”. Now I know what has been bothering me about the Trump debacle. How has trump been able to move under the radar of arrest for Sedition? What he has been doing with Putin is pure sedition. And since we never learn history properly, we’ve all forgotten what sedition is. Maybe this is an answer to getting a handle on stopping the muthafuka and his clan. Oscar took the beating and yet he was innocent. Let’s hope the World wakes a little. Thanks again! Frank Harrison Clark. Three things cannot be long hidden: the sun, the moon and the Truth. ‘Oscar was imprisoned for 35 years…jailed for seditious conspiracy: the same “crime” as former South African President and anti-apartheid leader Nelson Mandela. Puerto Rico A Beautiful Country Should Be Independent or Independent with an agreement with United States. Administration that still want Puerto Rico to still stay remain a “Half Pregnant Woman” (as one US senator once described us).